Chill Sleeves - Cooling arm sports sleeves are worn by athletes around the world, now it is your turn, but with added cool. Arm sports sleeves are worn by athletes around the world... now it is your turn... but with added cool ! Wearing Chill Sleeves feels like having an air conditioning system wrapped around your arms. Douse the cooling sleeves with cold water, then snap them, and they chill right down as a result of the fabric technology that they are constructed from. This performance fabric absorbs and retains sweat and water, then circulates the water molecules, while regulating the rate of evaporation. This delivers an instant cooling effect on the skin. When the arm cooling sleeves dry out, squirt some more water on them. It is that simple and super-refreshing. If you are working out hard, the Chill Sleeve quickly becomes soaked with sweat, and starts working. The Chill Sleeve is vented to maximise breathability. Wear the vented section under your arm. 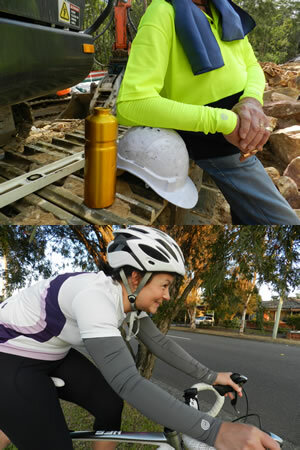 Often worn with short sleeve shirts, Chill Sleeve arm coolers are lightweight arm cooling sleeves designed to protect from heat and sun while you engage in outdoor activities like building, basketball, netball, tennis, mowing, cycling, fishing, triathlon training, softball, baseball, jogging, golfing, driving the car, bowling, kayaking and more. You can also use the Chill Sleeves indoors: at the gym, doing the housework, cooking, cleaning, Pilates, yoga, working at the computer. Crumpled-up, the Chill Sleeves will easily and conveniently fit into the smallest of pockets. Chill Sleeves stay up with the gentle hold of elasticised bands. Our cooling arm sleeves offer SPF 50 protection. SPF 50+ protects your arms from aging and sun. Instant cooling effect when wet. Can be machine washed with detergent. But do not use fabric softener. Chill Sleeves, cooling arm sleeves, come in a pair.